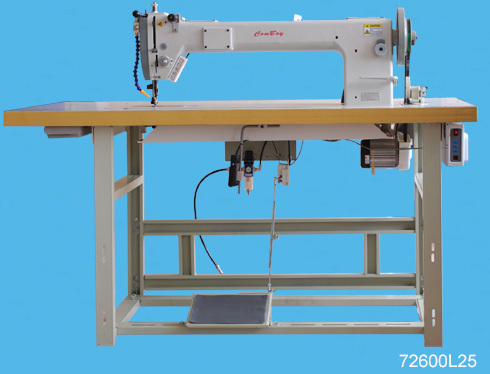 Features: This specialized sail making machine gives large working space underarm eliminates the effort and time needed to fold and roll wide sections of sailcloth and cover fabrics during sewing operations; This machine is recognized as the ultimate sail maker sewing machine currently available, it is capable of powering its needle through 20mm of Dacron, Kevlar, Webbing, Canvas and leather; Extremely strong needle penetration force, can easily sew sturdy webbing reinforcement and extra heavy sail corner patches; The large shuttle hook and bobbin capacity reduces the number of bobbin changes and offer high efficiency in sewing sails, tents and tarpaulins, using extra thick thread up to size V277; With 4 Cams for straight stitch, 1-step (2-points), 2-step (3-points), 3-step (4-points) zigzag, cover all demands of modern sail making industry; Standard supplied with heavy duty top and bottom feed puller, which is perfect for sail makers; This robust and reliable sail sewing machine is designed for mass-production sail making business (similar with Durkopp Adler 366-76-12-HM). 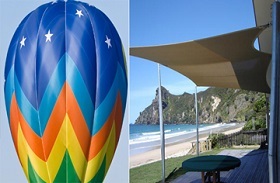 Applications: sails making and repairing includes cruising sails, racing sails, storm sails, tents, carpets, parachutes, tarpaulins, marquees, shade sails, mattress, truck covers, sofas and large size furniture. 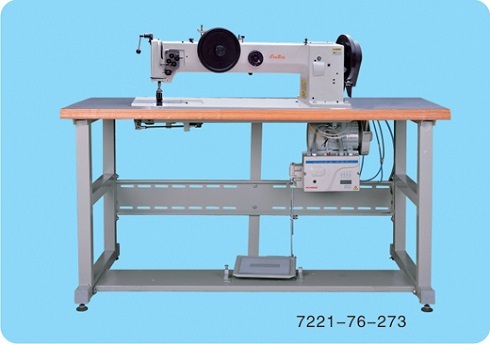 Feature: Made in Italy; The largest industrial zigzag sail making machine in today market, with 460mm(H)×1000mm(L) clearance room under the arm; The heaviest zigzag sail maker sewing machine with 27 mm of presser foot lift; Standard supplied with 4 cams for straight stitch, 1-step (2-points), 2-step (3-points), 3-step (4-points) zigzag, cover all demands of modern sail making industry; The large shuttle hook and bobbin capacity reduces the number of bobbin changes and offer high efficiency in sewing sails, tents and tarpaulins, using extra thin and thick thread up from V92 to size V415; The extremely strong needle penetration force, can easily sew sturdy webbing reinforcement and extra heavy sail corner patches; This huge sail making machine has been developed taking into account the requirements of sail makers and repairs, Its design with several new technologies, perfectly adapted to sew large sails and tents. Applications: large boat sails, storm sails, carpets, parachutes, tarpaulins, marquees, shade sails, mattress, truck covers, sofas and large size furniture. 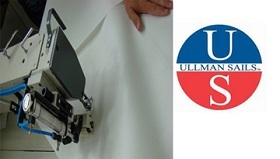 Feature: The application covers straight stitch, 1-step, 2-step, 3-step and 4-step zigzag in production of spinnakers sails, and up to medium heavy sails; It employs a parallel vertical needle bar motion for stronger striking power and can easily sew sturdy webbing reinforcement and heavy duty corner patches; This spinnakers machine is capable of powering its needle through 7 mm of Dacron, Kevlar, Webbing, Canvas and leather; The heavy duty built-in puller behind the pressure foot helps sail makers create a smooth, even stitch on windsurf sail; A wide range of sewing threads can be used: V46, V69, V92 & V138; Its modern design features: a zigzag width of up-to 10 mm and a stitch length of up-to 5 mm; It is interchangeable with Durkopp Adler 72525, therefore it is easier for the sail lofts already worked with Adler 525 spinnakers sewing machine . Applications: windsurfing sail, spinnakers, kitesurf, Code Zero, parasail, awnings, boat covers, upholstery panels, inflatable products, tents, awnings, parachutes, gliders, hot air balloons, bedding, quilting and mattress industries. 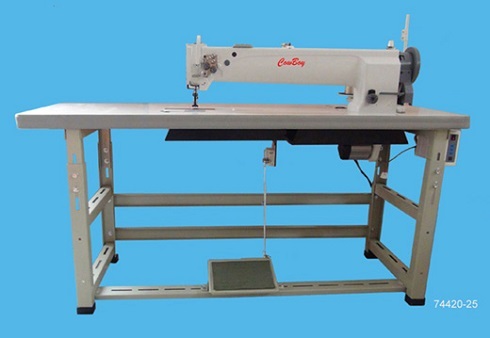 Feature: This machine is more suitable for difficult or very challenging sewing tasks. 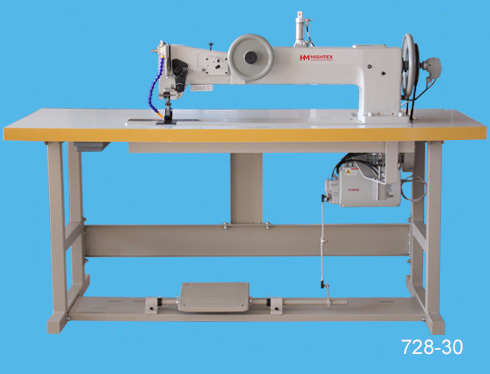 It is equipped with a long-arm surface, so you can have more space to move very large or thick materials such as canvas, vinyl, leather, synthetics, and various coated, laminated and rubberized fabric; The triple feeding system can definitely guarantee even and uniform stitches on your projects, like tents, parachutes, sails, tarpaulins, awnings, pool covers and awnings; The extra large vertically hook, and 20mm clearance under feet, can easily sew layers of slippery materials with thread up to Nm 10/3 with stitch lengths of 10 mm; Excellent climbing properties and high needle penetration power guarantee easy sewing thick spots or cross seams, without skipped stitch, loosing bottom thread and shorten stitch length; When processing thick threads and heavy-weight materials the robust design and the excellent sewing kinematics allow a constantly tight stitch formation and consequently accurate seams as well as neat stitch pattern. 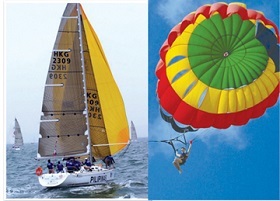 Application: boat sails, parachutes, tents, sheets, textile webbing slings, industrial safety products, tarpaulins, canopies, outdoor awnings, sleeping bags, military products, marine and furniture upholstery, automobile upholstery, hot air balloon, umbrella, shade sails, crane slings, backpacks, field covers, and heavy bulky products. 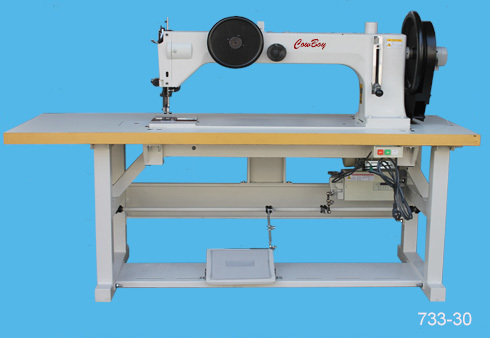 Feature: Long and wide working space is suitable for sizable materials such as military tents, tarpaulins, sails and canvas sheeting etc; It features a triple feeding action by way of: bottom feed, needle feed and walking foot top feed that can easily sew layers of slippery materials; Is fitted with two extra large vertically mounted hook & bases (6 times bigger compare to regular industrial sewing machine) for sewing with very thick thread up to Nm 10/3; Up to 10 mm long stitches for decorative topstitching seams; Excellent climbing properties and high needle penetration power guarantee easy sewing thick spots or cross seams, without skipped stitch, loosing bottom thread and shorten stitch length; A safety clutch is fitted to help prevent damage to the hooks, bevel gears and other important parts, should the machine become jammed or over-loaded; Heavy duty top and bottom feed puller is available as option. Application: tents, parachutes, sails, tarps, awnings, truck covers, leather sofas and other furniture upholstery, field covers, sleeping bags, sheets, military & tactical Gear, shade structures and heavy bulky products. 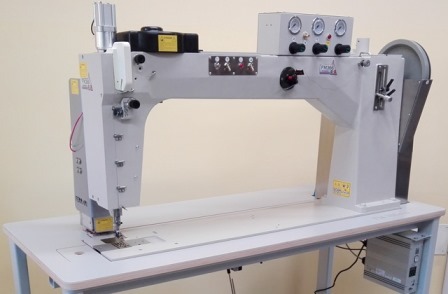 Feature: The sewing machine arm has been extended (complete casting, not a cut and piece extended arm) to give approximately 960mm clearance, which is very useful when sewing larger items, for example: sails, tents, covers etc. ; The walking foot action is fully driven and combines with the bottom feed and needle bar feed to produce a positive feeding motion for extra heavy use; It is fitted with an extra large shuttle hook assembly (204 type) for use with heavy weight & extra heavy weight materials and extra thick threads; The presser foot has an extra high lift and can go up to 23mm, allowing for a large range of heavy & extra heavy weight material to be used. 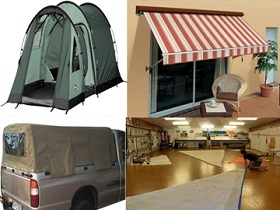 Application: sails, parachutes, tents, sheets, mattress, space suits, textile webbing slings, tarpaulins, canopies, outdoor awnings, sleeping bags, military products, marine and furniture upholstery, automobile upholstery, industrial safety products, hot air balloon, umbrella, shade sails, backpacks, field covers, and heavy bulky products. 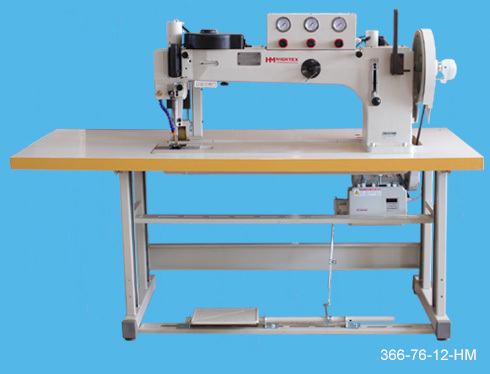 Features: This extra heavy duty top and bottom feed lockstitch machine comes with a 760 mm long arm clearance and extra wide bed to make it easy to sew large articles; The large machine pulley helps the machine to attain strong striking power - thus making sewing on multi-layer extra heavy material, whether slippery or gummy simple; The cam thread take up and large shuttle hook with large bobbin capacity mean less down time for bobbin changes, even using extra thick thread and has a thread rating up-to size T-700 (=2000d X3 or V693); Its extra high foot lift (32 mm) and long needle bar stroke make it the ideal machine in the sewing of extra heavy weight materials; Standard delivered with pneumatic presser foot lift, pneumatic reverse stitch and needle cooler. Applications: safety and logging belts, cargo slings, buffing wheels, construction barriers, tents, sails, parachutes, sheets, mattress, space suits, textile webbing slings, tarpaulins, canopies, outdoor awnings, sleeping bags, military products, marine and furniture upholstery, automobile upholstery, industrial safety products, hot air balloon, umbrella, shade sails, backpacks, field covers, and heavy bulky products. Feature: The sewing machine cylinder shaped arm has been extended (complete casting, not a cut and piece extended arm) to give approximately 960mm clearance, which is very useful when sewing larger items, for example: golf bags, luggage bags, industrial boots, covers etc. 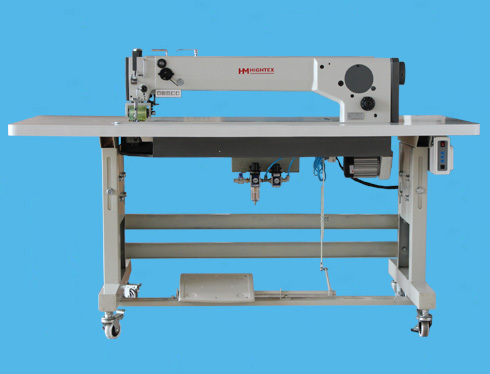 ; The special extra long feed up the arm cylinder machine is suited to sewing for example: large tubular shapes, golf bags, luggage bags, tents, sails, parachutes, umbrellas, fishing gear, cushions etc. ; It is fitted with an extra large shuttle hook assembly (204 type) for use with heavy weight & extra heavy weight materials and extra thick threads; The presser foot has an extra high lift and can go up to 23mm, allowing for a large range of heavy & extra heavy weight material to be used. 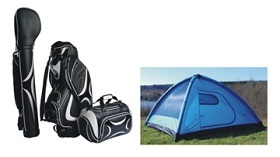 Application: large tubular shapes, golf bags, luggage bags, tents, sails, parachutes, umbrellas, fishing gear, carrying bags, transportation equipment, sporting goods, handles of hand bags, baseball gloves, sports apparatus, safety bags, seat cushions, saddles, harnesses, filters, general leather, upholstery products and other items where extra heavy duty feeding is required. 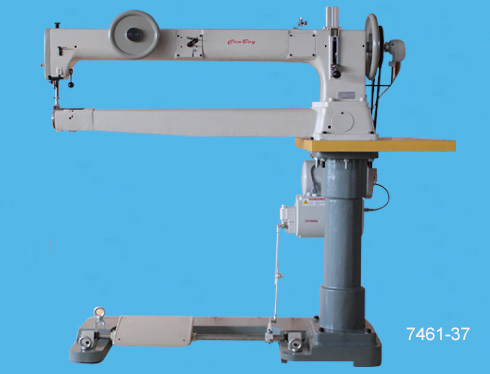 Features: The solid long arm is factory cast and offers greater strength & stability when compared to a cut and piece extended arm; It features a triple feeding action by way of: bottom feed, needle feed and walking foot top feed and is fitted with a large vertically mounted hook & base for use with medium to heavy weight materials; It is fitted with 2x large vertically mounted hook & bases which offer increased capacity for heavy duty sewing threads; A safety clutch is fitted to help prevent damage to the hook, bevel gears and other important parts, should the machine become jammed or over-loaded; With strong servo motor (Powerful + Quiet + Accurate Speed Control, different from so call "Energy Saving Servo Motor"or "Power Saving Servo Motor" in the market. 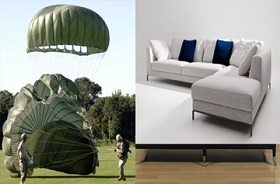 Applications: large covers, upholstery panels, car trimmings, awnings, tents, awnings, sofas, parachutes, gliders, hot air balloons, sails and general leather goods. 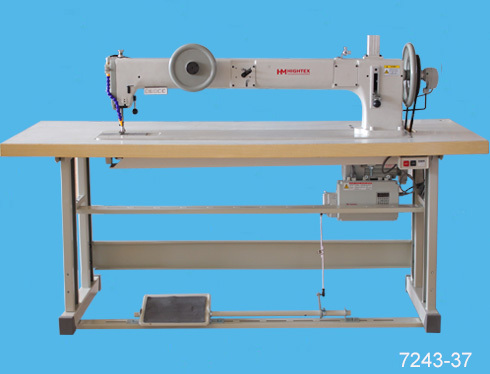 Features: The long sewing machine arm allows up to 635mm clearance to the right of the needle, which is approximately two and a half times the clearance of a standard arm machine; The walking foot action is driven and combines with the powerful bottom feed to produce a positive feeding motion for extra heavy use; Fitted with Singer 132K type large horizontal axis hook & bases for use with heavy to extra heavy weight materials, used for sewing thick leather, canvas, fabric, plastic, webbing, fiberglass, Kevlar, rubber; It is a friendly and high efficiency industrial sewing machine suitable for all heavy weight sewing applications; With strong servo motor (Powerful + Quiet + Accurate Speed Control, different from so call "Energy Saving Servo Motor"or "Power Saving Servo Motor" in the market.